Bringing the internet to the 4 billion people not currently online would add $6.7 trillion to the global economy and lift 500 million people out of poverty, new research has found. The report, prepared for Facebook by PwC’s strategy consultants Strategy& , looks at mechanisms for encouraging global inclusion and connecting the world through the internet. With access to the internet being declared a basic human right by the United Nations , the importance of connecting the 55% of the world’s population who are offline is a truly global issue. Universal, affordable internet access is part of the UN’s Sustainable Development Goals, and governments, companies, local and international organizations, and members of civil society are all working to get more people online. The majority of internet users are based in the developed world, with developing countries still having more people offline than online. What is behind the digital divide? The main barrier to connecting people in developing countries is affordability. For 66% of the world, a 500MB data plan costs more than 5% of their monthly income, an amount deemed to be unaffordable. Broadband is only affordable for 100% of the population in 29 countries, the World Economic Forum found . According to the World Economic Forum’s Internet for All report , there are four main reasons behind this digital divide. Apart from affordability, infrastructure was also found to be a big barrier. Around 600 million people in sub-Saharan Africa do not have regular electricity access , a problem that also affects nearly a quarter of people living in South Asia. Skills, awareness and cultural acceptance, along with local adaptation and use, also prevent people from making the most of the internet. The Strategy& report highlights the need for a transformation of the internet, to become better suited for users in developing countries. For example, the vast majority of online content is only available in 10 languages. As the Strategy& report notes, with the main barrier to internet access being affordability, the focus should be on cost reduction. 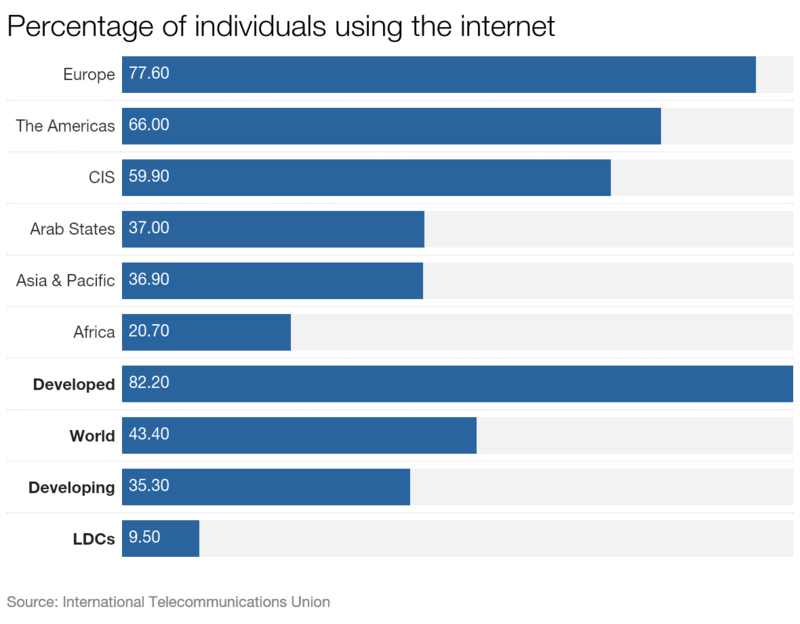 To get 80% of their populations online , Ethiopia, Nigeria and the Philippines would all need to cut the price of internet access by over 90%. One way of reducing the cost is my making technological improvements and improving infrastructure in developing nations. An upgrade from 2G – used by most of the world – to 3G or 4G mobile internet would reduce the cost of mobile data. However, the Strategy& report notes that upgrades such as these require significant upfront investment. The World Economic Forum’s Internet for All report urges governments to introduce policies to improve infrastructure and provide financial assistance to those who cannot afford the costs associated with connectivity. Innovative, disruptive technology will play a role in closing the digital divide. Global inclusivity will need emerging solutions to reach the remotest and very poorest. Companies such as Google and Facebook are already working in this area, with projects such as Google’s Project Loon , providing internet connection using balloons. Facebook has created a solar-powered, laser armed 4G drone called Aquilla , as well as a low-cost internet access project , providing users with access to some areas of the web, including Wikipedia and Facebook, for free. What's clear from all these strategies is that closing the digital divide will require a collaborative effort from communities, governments and businesses across the world.